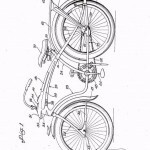 6 search results for: "bluebird"
These are the original design patent documents for the Elgin Bluebird bicycle, attributed to Kelvin H. Booty, assignor to Sears, Roebuck and Co. 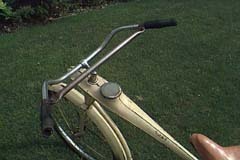 The application date is January 11, 1936, which is strangely a year after the bicycle was actually being sold by Sears. 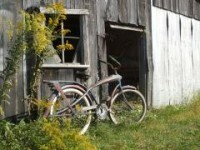 The application was approved on May 7, 1940, long after Sears ceased production of the bike…. The last Bluebird model ever made. Some incorrect parts on this bike. The seat is from a post-war Monark, and the tail reflector is from a ’36 Silver King…. 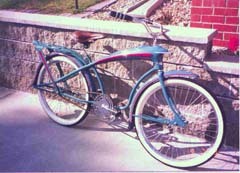 The Elgin Bluebird was the most radical streamlined bicycle ever produced during the 1930’s. The frame is made up of a stamped steel fuselage that is actually a structural part of the frame. There is no top tube. The fuselage also had a speedometer and headlight built into it, along with a trap door allowing stowage of tools…. Unrestored Elgin Bluebird. These bikes are one of the most coveted by collectors. 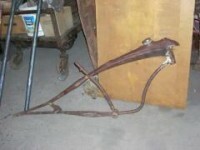 Great lengths are taken to complete these bikes and restore even the worst condition parts….